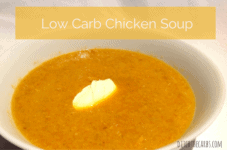 Here is another easy recipe, this time making low carb chicken soup in the slow cooker. And again, it is almost free. After having a roast chicken, leave some meat on the bones and add the chicken carcass to the slow cooker with whatever veggies you have at hand. Unlike the bone broth recipe, you only cook this soup for a few hours and keep the meat and vegetables to puree into a smooth soup. 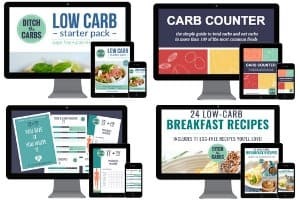 Bone broth however, is cooked for up to 24 hours and the bones and vegetables discarded as all the nutrients have been slowly boiled out into the broth. This low carb chicken soup makes for a more substantial meal, add some cream cheese or sour cream at the end. 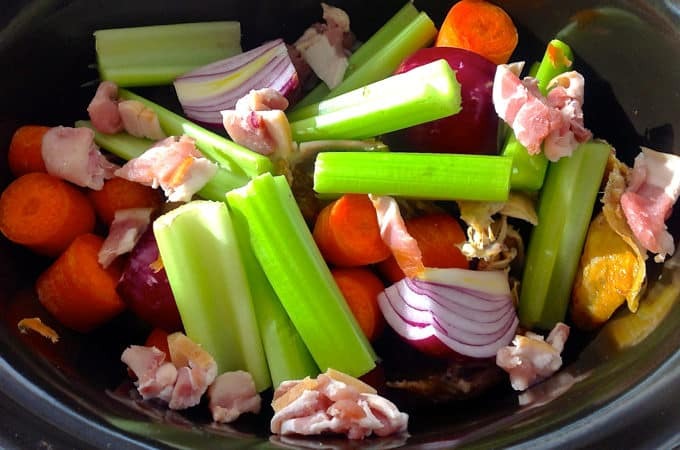 Place all the ingredients in the slow cooker and cover with boiling water. Remove the bones and place the meat back into the soup. Puree with a stick blender with the blade attachment. Serve with cream cheese or sour cream. Do you think I could cook it longer in a slowcooker? So put it on in the morning and come home to the yummy soup? Lets say 10hrs? Absolutely, that would be great. I love using the slow cooker, such an easy way to come home to a cooked meal at the end of a busy day. Great suggestion Aleisha. Presumably this can be cooked somehow on the stove for people who don’t have a slow cooker? Yes, just simmer on the stove for 1-2 hours. My favorite soup is chicken. I never thought of putting bacon in the stock but what a fabulous addition. I would also throw in a bay leaf. Lovely recipe. It’s very challenging to get out all the tiny pieces of bone and cartridge from soup! Any suggestions on this? The amount of fat in the broth can vary between chickens, or if a different meat is used. Try skimming the fat off once it has cooked, or place it in the fridge once cool, and the fat will solidify at the top then you can remove it. Hi Linda, pour the bone broth through a strainer to easily remove all the bones and pieces.